So where have I been for the past three weeks? The month of April went by in a blur as I had to walk my leaders through an excruciatingly difficult situation. What’s interesting about that experience is that it reminded me that Paul’s letters to churches and leaders were not just nice theology, but some very practical advice. Thank you, Paul. What else did I notice throughout the process? The ‘noise’ of my thoughts, and other people’s advice, with a splash of panic thrown in made it very difficult to hear clearly from God. When you need wisdom the most, it seems so hard to find or pin down. Although I’m not so sure that’s the case, either. Part of me thinks it is simply some fear and trepidation with having to make difficult decisions. Difficult times are a reminder that anyone can lead when things are going smoothly; it’s when things are hard that a leader is needed most. There are moments in these times when you feel all alone, and I think much of that ‘feeling’ comes from wishing that someone else could make the decision. Difficult times are exhausting…and that’s why I took a vacation. I could think of a million and one reasons why the church needed me (it’s an ego booster), but in reality, my mind and soul needed me more…I needed to be a pastor to me, and look after myself…and so I did. I spent the middle part of my week doing some never-ending yard work…but ‘book-ended’ my week feeling like a kid. Last year, April and I purchased a rickety old trailer (well, ‘purchased’ is debatable when you consider we paid a dollar for it). 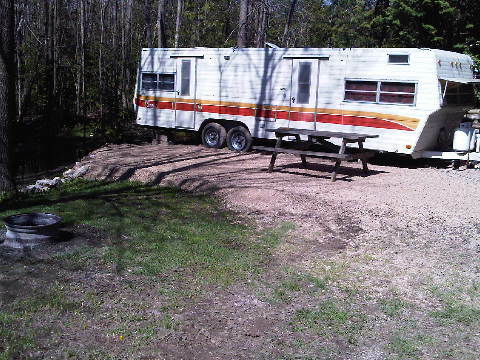 We’ve rented a space for the season in a campground. This past week I spent time opening it up, doing some little repairs and making it our little retreat. It felt good and fun at the same time. In fact it reminded me of when I was a boy and my friends and I built a fort for us to call our own and to escape and pretend. It was built of boards, odd pieces of wood found at our homes or in the bush. We would use some old nails and anything else we could find to hold it together. We told no one about it and made it ours. This trailer isn’t much to look at. It’s old, and has seen better days, but there’s something about fixing it up, using boards, odds and ends, and slowly making it my little ‘fort’…a place where I can squirrel away and pretend or dream, or simply a place for April and me to unwind and just ‘hang’. Our plan is if we like doing the ‘trailer’ thing, then we’ll buy a ‘real’ one that is in much better condition and fit in with our neighbours. The only thing is, I’m not so sure which is the ‘real’ deal. As I drive around my neighbourhood, I see house after house where mom & dad have bought their children a pre-packaged ‘fort’ from their local Sears store. It’s ‘nice’ and perfectly ‘put together’…and very two-dimensional. There’s no imagination, no day dreaming, no 10 year old ingenuity…it’s very safe and really dull. Maybe I’m the only one in the trailer park with the ‘real deal’!